rvatives, antibiotics or hormones, these healthy dog treats provide flavor, crunch and plenty of chewing entertainment. Barkworthies Chicken Wings gives you the entire chicken wing in a single-ingredient dog chew making for a tasty way to treat your four-legged friend! Use our Chicken Wings dog treats as a daily way to satisfy your pup’s chewing appetite! 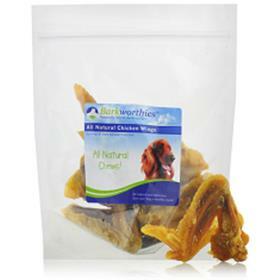 As with all of our products, Barkworthies are additive-free, chemical-free, and preservative-free dog chews. In fact, most Barkworthies products are all-natural, single-ingredient chews, making them a healthy and safe choice for your dog.